This process began with a team member picking a stakeholder from any of the four boards (People, Enterprise, Management, Organisation) which for some reason interested them and explaining why. Then another team member would pick a second stakeolder from any of the four boards which they felt was linked to the first in some way whether similiar , contrasting or complementary etc. Then another team member would pick another stakeholder to add to the group and so on, until the Team Leader decided that the group was full – usually when there were between 4 or 7 stakeholders. After 5 or 6 such groups were created the team split into smaller groups and tried to work out what the strongest or most interesting links or themes were within the group. This often included removing certain stakeholders who did not fit the themes we had discussed or in some cases bringing in new additional members to expand a theme. The team was then split into groups of two in order to develop a ‘Process’ for each of the groups of stakeholders. The idea of a ‘Process’ is a method of conducting interviews / workshops developed (as far as I can tell) by a group called the Kaos Pilots in Denmark. These ‘Processes’ seem to revolve around the idea of introducing theatrical elements into the interview process in order to gain information and insights which a more traditional type of qualitative interview would not uncover. It also seems that the theatrical elements should themselves relate in some way to the the themes under consideration and the outcomes or information which is sought. Nuala and I were allocated a stakeholder grouping which included : two representatives of big business – Bill Cullen & Dermot Desmond , the theme of Drugs, the Gardai, Moore Street Markets and Freerunners. The previous discussion about this grouping had identified various themes centred around enterprise. After reviewing this grouping Nuala and I decided to limit the stakeholders to: a representative of big business / a representative of the Moore street markets or market trading in the city / a freerunner or a representative of urban sports. Having some experience of the methodology of more traditional qualitative interviews, I found the task of introducing new theatrical elements to the process quite difficult. While my instinct was to spend time examing the issue at hand, the kinds of information I wanted to gather, and the kinds of questions or topics which would elicit the richest responses from interviewees, here, I was concentrating on what unusual environments and activities we could introduce to the process. We decided that we would hold our ‘Process’ in a Polish cafe/restaurant in the Moore Street Mall. This shoppping mall is a buzzing, vibrant hub of international businesses and cafes. We felt that holding our ‘Process’ in such an enterprising environment might provide fodder for discussion and thought. We also decided the journey to the venue could be used to highlight areas of grey / black enterprise in the city and issues of regulation/ enforcement. We decided to meet our 3 participants at our office on Ormond Quay, walk to the restaurant via the boardwalk (often a venue for drug dealing /taking) and to stop at a street trader stall to buy prizes (knock -off Louis Vuitton Scarves) for a game which we would play with the participants in the cafe. We decided that the game we would play would follow of a brief discussion of the central themes and that both Nuala and I would participate as players. After discussing the themes we would ask the participants to write a question about enterprise in the city centre. The question could be about problems related to enterprise, why certain enterprises were represented, or issues related to their own personal experience with enterprise or enterprising people in the city. We would write out our own questions by way of example. These questions would then be put in a bowl, a pen/marker spinned to select the first person to play and they would ask the question of the person to their right. That person would answer and we would discuss the issues / ideas which arose. Then the question would be laid out on the table. Next the marker would be spun again and so on until we had asked all of the questions. Then the answer which the group liked best would be voted on and a prize given. We decided that we would have three rounds of the game, and then a period for general discussion in which we would discuss the themes/issues which had arisen and introduce some new questions if they had not been covered. We also discussed the possibility of making table mats from laminated sheets which had headlines related to city enterprise or general themes which might be evocative. The process was planned to last for two hours, with 20 minutes for the walk to the venue and one and a half hours for the game in the cafe. 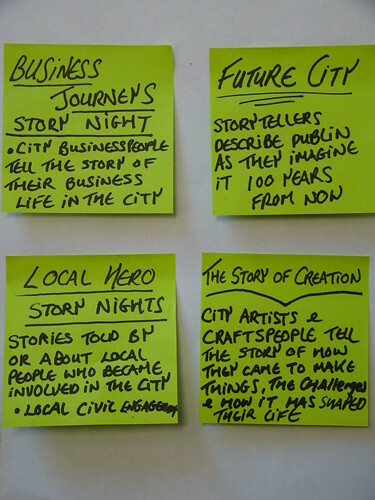 In discussions with each other, the group, and the team leaders Nuala and I decided to narrow the theme of our process to ‘How the City Supports Enterprise’. We also decided that we would not use the laminated table mats with headlines or themes printed on them. In the two days before we ran our ‘Process’ we were visited by Kristin & Paul, two ex Kaos Pilots and ‘Process’ experts. Each two person team, including myself and Nuala, had an opportunity to trial parts of our process and refine it. Kristin suggested that we would change the game and vote on the different qualities of questions rather than the answers. She also suggested that we could have a number of categories for prizes – such as most curious question , most surprising question. This was great advice but as it had been so difficult to arrange the first games structure I was anxious as to how we would have time before the follwing afternoon to re-make our game. I found designing a game much more difficult than I would have expected. It needs a lot of thought and plenty of trialling to ensure that it will work. I developed sets of words / ideas which were both related to the five main themes which we had been given – Storytelling / Entrepreneurship / Interaction / Society/ Spirit – and to urban environment / culture. I performed internet searches using these words / themes / ideas in an attempt to find sample projects. The group discussions revealed that other team members were focusing on projects which had taken place in Dublin City or were ongoing so I decided to focus primarily on international projects. Some projects which I found resulted in me moving away from finding sample projects and developing ideas for projects which could be applicable to the city centre. Throughout the process there was a continuous movement between finding sample projects and developing ideas. View more presentations from PaulDesigningDublin. As with the development of the examples, the ideas were to be formulated under the five areas of discovery - Storytelling / Entrepreneurship / Interaction / Society / Spirit. In developing 100 ideas I did not work within any particular framework, but rather thought about what changes I’d like to see in the city, what problems I felt existed, and any ideas which might solve these problems. I also spent much of my time visualising the city, remembering what I like about it, what I’d like to see more of, and any memories I could conjure up relating to times I had enjoyed most in the city. Frequently time was spent just wondering, without any structure, about what could happen in the city. In generating ideas, one of the first difficulties I encountered was related to having to limit the description or components of the ideas to one post-it. This restriction tended to result in ideas which could be explained in buzz words or were one day themed events rather than more detailed projects. The Stakeholder and User identification process began with us examining the lists of stakeholders contained in ‘Love the City’ book, a document which had been created by the the scoping group prior to our arrival. Under the category of People we were asked individually to construct scenarios developing specific characters and detailing to some degree their relationship to the city. Brief descriptions of these characters were written on post-its and stuck on a board. Under the category of Enterprise we were asked to come up with 20-30 sub headings such as ‘Retail’ , ‘Evironmental’. Then we split into groups of two/three and came up with lists of enterprises under these headings while being timed – with a period of 3 mins for each sub category. Under the category of Management we were asked to come up with 20-30 sub headings such as ‘Environmental’ , ‘Waste’. Then we split into groups of two/three and came up with lists of enterprises under these headings while being timed – with a period of 3 mins for each sub category. Under the category of Organisation we were asked to come up with 20-30 sub headings such as ‘Youth’ , ‘Arts’. Then we split into groups of two/three and came up with lists of enterprises under these headings while being timed – with a period of 3 mins for each sub category. There were frequent overlaps of suggested stakeholders across the four categories and within the sub-headings.